Watson Contracting operates in Mid-Canterbury which is in the heartland of the rich & fertile Canterbury Plans in the South Island of New Zealand. The area in which we operate is defined as being between the Rakaia and Rangitata Rivers and from the mountains to the sea. It is a magical area and we are proud to be a part of this successful farming community. Watson Contracting offers a total solution for your balage, hay and straw requirements. 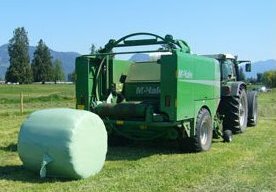 Our services cater to a wide range of baling requirements including raking, baling, wrapping and cartage.